choluric jaundice Description, Causes and Risk Factors: Jaundice with excessive amounts of unconjugated bilirubin in the plasma and without bile pigments in the urine. In man, acholuric jaundice was first accurately described by Minkowski at the beginning of this century. tyniThe human form of this malady is sometimes divided into a hereditary and an acquired type, of which the former is more common. The first kind belongs to the inheritable diseases, occurring often in several generations, occasionally in several members of one family without the descendants having the condition, and also in a single member of a family who may be affected from birth. As a result of the precedence of the above findings, the hereditary form in man is often alluded to as the Minkowski-Chauffard type, and the acquired form as that of the Hayman-Widal syndrome. Familial acholuric jaundice in man has usually been associated with metabolic derangements such as albinism, pentosuria, glycosuria, etc., of which Gates says, “In all such cases of inborn deranged metabolism the probable cause is the lack of an enzyme in the absence of which a chemical step is missed and some normal metabolic process fails to take place.” Campbell and Warner’ have a record of acholuric jaundice in five generations of a family, in which two latent carriers were included. The latter, although normal in appearance upon examination were found to have an increased erythrocyte fragility and also to show slight indications of increased blood breakdown beyond that of normal individuals. Hemolytic Jaundice results from increased destruction of red blood cells in circulation or the precursors of the red blood cells in the bone marrow leading to the yellowish discoloration of the eyes, skin or mucous membranes; Hemolytic jaundice is also known as Acholuric Jaundice because there is excessive amount of unconjugated bilirubin in circulation; this increased destruction of the red blood cells leads to elevated levels of bilirubin in the blood: a condition called hyperbilirubinemia. The type of bilirubin released in Hemolytic Jaundice is known as Unconjugated Bilirubin; hence when hemolytic jaundice causes hyperbilirubinemia, it is called unconjugated hyperbilirubinemia. Unconjugated bilirubin means it is not attached to glucuronic acid yet and can only be transported in blood by binding to Albumin. 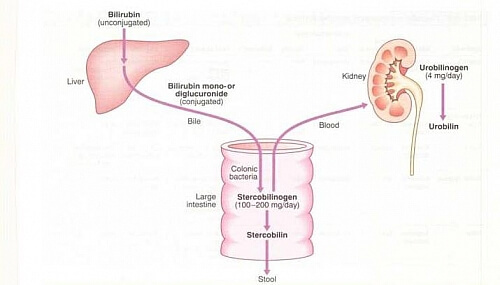 Because bilirubin is not soluble in water, it means that that before it can be excreted in bile, it must be conjugated. When it is attached to glucuronic acid, it is called conjugated bilirubin. When conjugated bilirubin (now water soluble) is found in urine, it means it is not caused by hemolysis (breakdown of red blood cells). Hemolytic jaundice is usually mild when the liver function is normal. But when the function of the liver is deranged, it makes it difficult for the liver to excrete the excess bilirubin and this causes accumulation of unconjugated bilirubin in blood and only then will Hemolytic jaundice becomes severe. Hence, in severe liver disease or in newborns (in this case, the bilirubin transport mechanism is not yet mature); the jaundice of hemolysis is severe. Infants may appear jaundiced and pale. Fatigue, weakness and shortness of breath are other symptoms that may be considered in elderly patients. The spleen may be enlarged. Gallstones may present in majority of cases. The diagnosis rests on (1) the strong family history,(2) the occurrence of considerable blood destructionwithin a very short period, (3) the characteristicincrease in fragility of the child’s erythrocytes andthe spherocytosis, (4) the exclusion of other causesof hemolysis at this age.Acholuric jaundice is recognized to be due toan inherited defect of the erythron, which is demonstrated by the abnormal erythropoiesis seen in bonemarrow smears, by the abnormal contour of theerythrocytes in the circulating blood, by theirexcessive fragility in saline solutions, and by theirliability to rapid destruction in the body. Treatment may include splenectomy (removal of the spleen). Once this is done the red blood cell life returns to normal. It is generally agreed that the administration of liver or iron, and the use of x rays or radium, has little or no effect on acholuric jaundice. The management of the individual case turns, therefore, on whether the spleen should be removed, and if so at what stage. Pre-hepaticular jaundice is caused by anything which causes an increased rate of hemolysis (breakdown of red blood cells). Unconjugated bilirubin comes from the breakdown of the heme pigment found in red blood cells’ hemoglobin. The increased breakdown of red blood cells leads to an increase in the amount of unconjugated bilirubin present in the blood and deposition of this unconjugated bilirubin into various tissues can lead to a jaundiced appearance. In tropical countries, severe malaria can cause jaundice in this manner. Certain genetic diseases, such as sickle cell anemia, spherocytosis, thalassemia, pyruvate kinase deficiency, and glucose 6-phosphate dehydrogenase deficiency can lead to increased red cell lysis and therefore hemolytic jaundice. Commonly, diseases of the kidney, such as hemolytic uremic syndrome, can also lead to coloration. What are the clinical features of haemolytic jaundice? Acholuric urine means freshly passed urine is of normal colour as there is no bilirubin in urine but if the urine sample is kept for sometime, this will turn dark yellow due to conversion of urobilinogen to urobilin by oxidation. Stool is high-coloured due to excess amount of stercobilinogen and stercobilin. Jaundice is usually mild and there is lemon-yellow tinge of bulbarconjunctlva. Serum bilirubin is usually less than 6 mg/dl and this is predominantly of unconjugaled variety. Anaemia is present .It can be mild, moderate or severe, according to the degree of haemolytic process. What are the causes of Haemolytic jaundice? Primaquine or sulphonamide-induced (in GePD deficiency).